It feels good to be back and I couldn't have thought of a better way to celebrate my return to blogging than to talk about how I loose $hit all the time! Assignment: The last thing you lost. Ok, so to be totally honest, this story is not about the last thing I lost. I loose things on a daily basis. I do. I R.E.A.L.L.Y do. From the outside looking in, you might think I am one of the most organized, type A personalities going and that IS true when it comes to certain aspects of my life. Mainly, planning parties and/or events, family scheduling and work related duties. Otherwise, I am a total wreck in the organizational department. Hence, I loose things constantly. This story is about the last thing I lost that COULD have caused my husband to divorce me. I am only kinda kiddin'. Sometime around Christmas, I stopped even using that little wallet and started using what I have coined the "Bra-Wallet". You know, sticking your cards and ID in the top of your bra. Classy. I know. Don't ask me why but I think it allowed me some false sense of security that I couldn't possibly loose anything so close to my heart...LMAO! AS IF! This $hit really exists? I guess I didn't coin that term after all?!?!? I went grocery shopping one night before a meeting. Long story short, when I arrived at my meeting I did the ever so in-conspicuous "Bra-Wallet-Sweep" to make sure everything was in it's place. It wasn't. The credit card was missing. OMG! I frantically searched the van with no luck. I should probably confess here that the only other time I have ACTUALLY lost a credit card was when I was about 7 1/2 months pregnant with Ave & Bryce and it must have "slipped" outta my pocket (oh ya! I was a "Pocket-wallet" person for a while too!). Daddy Dave handled that VERY well and I am sure it was because I was carrying his children otherwise, I am sure it would have been D-I-V-O-R-C-E. Since I was not "with child or children" I went straight into panic mode. Daddy Dave had been riding my a$$ for years about using a proper wallet and purse and when he got "wind" of the new "Bra-Wallet", well, he almost lost his mind but I assured him that I didn't need him "policing" me and my wallet choices AND until I lost something he should just keep quite. I wasn't very nice about it. I wish I would have been nicer about it...LOL! I hate eating crow AND I knew there would be some serious damage control needed if I had to tell him I had let the family credit card slip out of my "Bra-Wallet". Because I was totally beside myself, my girlfriend called the store to see if I had left it there and when that was a big fat negatory, she left my contact information in the event it was "found". I had pretty much come to the realization that I was going to have to face the music. The dreadful music. As luck or fate or my guardian angel would have it, I was 1/2 way home from my meeting when the store called to let me know that someone had found it in the middle of the parking lot...in the snow. The lady on the phone was sure to tell me just how "fortunate" I was that someone actually saw it in the heaps of snow AND was "kind" enough to turn it in to the store. She had NO IDEA how true that was. 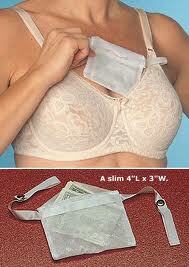 Needless to say, the "Bra-wallet" is no longer something I use. Ya I know. It's something I should have never been trashy enough to use but from time to time I like to walk on the wild side...you know what I mean?!?! I know people who are constantly losing their wallets! That would stress me out; maybe having it attached to your bra really is the best solution. Bwahahaha!!! I think I used to be more organized in the wallet / purse department, but things have definitely changed since the girls were born. Even though it's better since I don't use a diaper bag anymore, I'm still switching between purses more often, depending on where we're going and what I need to carry. Then, I'm SO BAD to just stick things in my purse at the end of a transaction. I'm balancing two kiddos, and by the time we're finished shopping / eating, I'm usually just ready to get outta dodge. I don't always take the time to put my card back in the little slot, or fold the receipt and put it exactly where it goes in my wallet. Fortunately I haven't lost any credit cards, but it's driving me NUTS that I can't find my Panera loyalty card. It's not a huge deal...they just look my number up when I order something...but it just drives me CRAZY that I've lost it. So glad for your good fortune in finding your card! Glad it all turned out in the end. But NOW what are you going to do? While I carry a purse with a wallet in it, I have gotten into a very bad habit of just throwing credit cards, cash, etc., in my purse without bothering to put them back in the wallet. I am SO going to get myself in trouble doing that, because my husband will NOT be amused if I lose a credit card! I always carry a purse but I do have the tendency to toss the cards into the abyss and have to do some searching. How lucky you were! Glad your marriage is still intact. ;-) Thanks for stopping by my blog. Have a fantabulous weekend!